I’ve been in pursuit of the 1 size fits all bagel and English Muffin cutter. I have 1 more style in mind, but it probably won’t get built. When I made the cutout in the sapele and maple piece, I saved the offcut, and sliced it into shims. 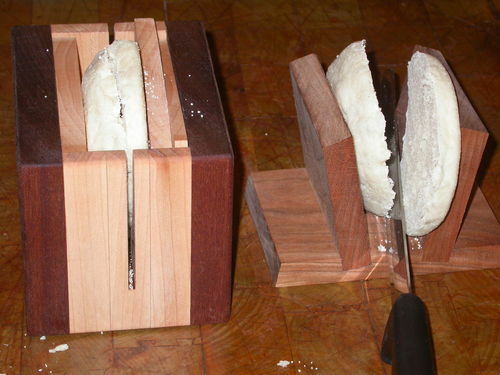 The shims help on thinner bagels and muffins. The above cherry v shaped holder uses 5 degree angles. I made another cherry holder at 7 degrees. The 5 degrees seems to work better. I think both could be a little wider at the base for bagels, but ok for muffins. My preference is the sapele and maple with shims. The bagels are firmly held and fingers are away from all the action. 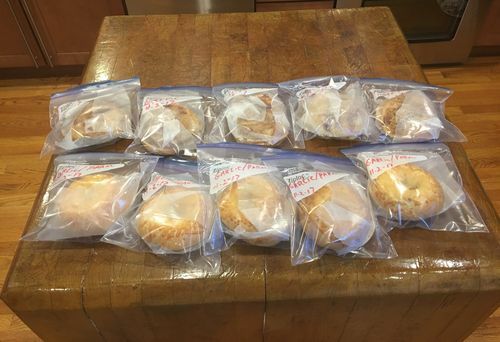 It comes in handy when the bagel store has buy 6 get 6 free. Apple pie bagels are so good! Very cool- like the concept! Man … what are you doing cutting your E-Muffs with a knife? Those are to be fork split!! Youre gonna lose your nooks and crannies for cryin out loud! Nice work, Harry! I am craving some carbs now. good idea, I will steal it shamelessly. Hairy, this is a very creative project and looks like it’s a practical and useful utensil. Nice work. My mouth is watering just looking at that nice tasty food. Great idea Hairy. A good safe cutting method!!! Cool idea. I often wonder if it will be “this time” when I am cutting bagels, English Muffins, and biscuits. I suppose I’ll act after the fact though, stubborn idiot best classifies me. hairy one, That is a cool idea for ”bagel lovers”... however, not so cool for us that grow our girth through over indulgence in protein! What about us Philistines…? Ever considered a similar contraption for taco shell stacking?... I’d kill for one (or two (or three(or….))) ! What a great idea. I’m going to copy from you and make one for me. What about us Philistines…? Ever considered a similar contraption for taco shell stacking?... I d kill for one (or two (or three(or….))) ! I think I just got some taco stand inspiration. Thanks! -- Phillip- Measure twice, cut onc.... Hey look, it's rustic.